If you are interested in coaching in the Calumet Hockey Association and would like more information, please contact our Association Coaching Education (ACE) Coordinator, Bruce Coppo (337-2957). If you have a son or daughter just starting to play and you would like to get involved, our Initiation Program is a great opportunity. You can attend a local coaching clinic, become certified, and take an active role in developing our players' essential skills. Contact Bruce Coppo for more information. 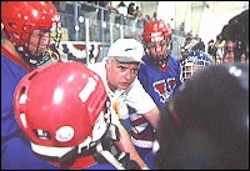 For current coaches or coaches looking to get back into the game, the Michigan Amateur Hockey Association (MAHA) and USA Hockey both have the latest coaching requirements, clinic dates, and other resources posted on their web sites.